What a beautiful week it is. Spring is really here...well, o.k. it was 82 today! That's North Carolina for you! Tomorrow is going to be more seasonable. Today I am sharing a few more pictures from Replacements Ltd. 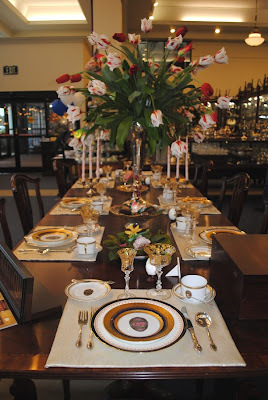 This huge store is an amazing place to visit for anyone who loves setting a beautiful table. They have new and vintage pieces as well as wonderful service for finding a pattern you want, cleaning your silver and even educational classes. See this beautiful cup...it is a Shelley. The pattern is called Lilly of the Valley. (This is not my cup, but one on display at this store. It was not very pricey, yet I just saw it on eBay for $199.) I have childhood memories of this beautifully fragrant flower. It wakens early in spring and delights anyone who sees it. Shelley is known for their high quality china. Their cups feel good in the hand. They are easily recognized by this ruffled edge. I think this cup shape is called the Dainty Tea shape. Shelley began operation in 1860 in Longton, Stoke on Trent, England. Henry Wileman began the company (the company named after him) and two years later Joseph Shelley joined the company. When Henry passed on, his two sons (Charles and James) took over the company, and when Charles retired, James made Joseph Shelley his partner. James eventually went to the earthenware works leaving Joseph in full charge of china. Joseph's son Percy joined the company and when Joseph passed, he was in full control for 50 years or so. He brought in many famous artists and the name of Shelley became know for it's fine quality and designs. This story is similar to many of the china companies. Often beginning with one name and one family, taking in other members, and then passing the company on to them, hence another name change. These histories can be quite convoluted! Just a sample of some of the china for sale. I took this picture through glass, so it is not as clear as I would like. 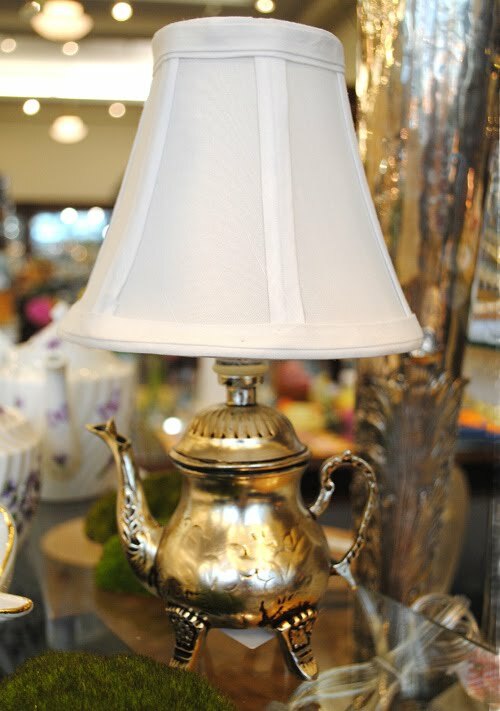 Beautiful silver tea pot lamp! 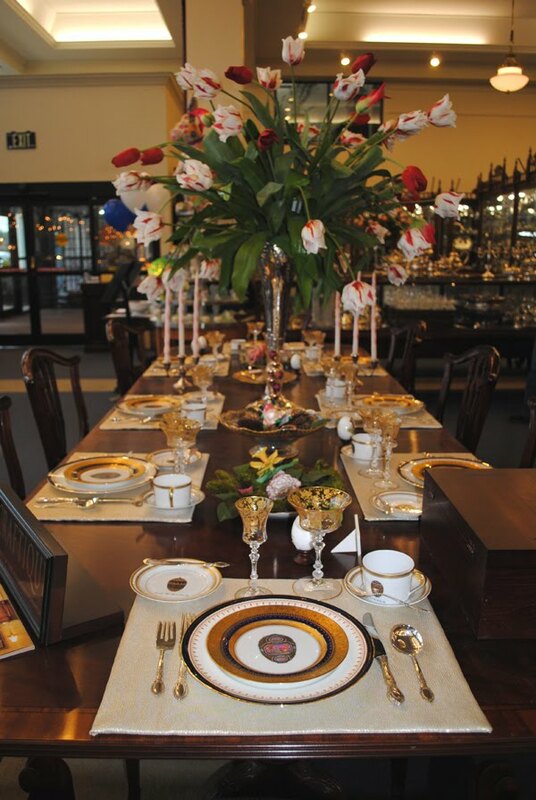 This stunning table is set for Easter. And a very regal Easter Egg cup, and dishes. Martha and I are so happy to have you play along. If you want to, just create a post with a tea cup that you would like to share. Come back here and enter the link to the post with Mr. Linky below. Make sure you test your link, because once in a while it will not take us to your site, and we do not want to miss visiting you! If you are in the Easter Tea Cup Swap (now closed) would you please e-mail me and let me know if you have connected with your swap partner. If you have any questions at all or if I can help you in any way, just let me know. Lilies of the Valley deck my garden walk. Oh, don't you wish, that you could hear them ring? Only in the morning when the bluebirds sing!" That is a beautiful lily of the valley teacup. I love the fluted edge and green stripe. They have the sweetest smell... we used to have a whole patch of them growing wild out by the back door of our first house. I LOVE Shelly and zap it up whenever possible. 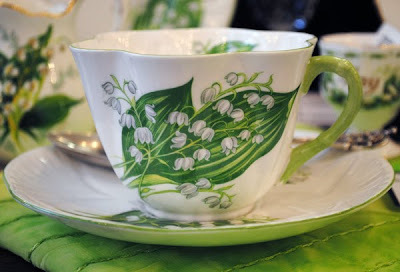 I especially LOVE Lily of the Valley ANYTHING so I would LOVE that cup and saucer!!! what really caught my eye today is that darling silver teapot lamp! OH MY, "LOVE THAT"!!! Thank you for sharing. Shelley made about 50 shapes...this is just the shape they are best known for called the Dainty shape. I love Shelley. Lily of the valley is so spring! I bet you had a ball at Replacements just looking at all the goodies! Lily of the Valley is really pretty and so unique, love the pattern and the fluted edge. Thanks for sharing! You show again so amazing china. I often go on the homepage of Replacements for searching patterns names. Because I am not in USA it would be very expensive to ship items to Germany. But it is really an amazing store. Thank you for hosting again this sweet event. I love this cup, for us in the family Lily of the valey is my mohters flowers, she had them as her bridal bouquet.. The Lily of the Valley teacup is just beautiful! 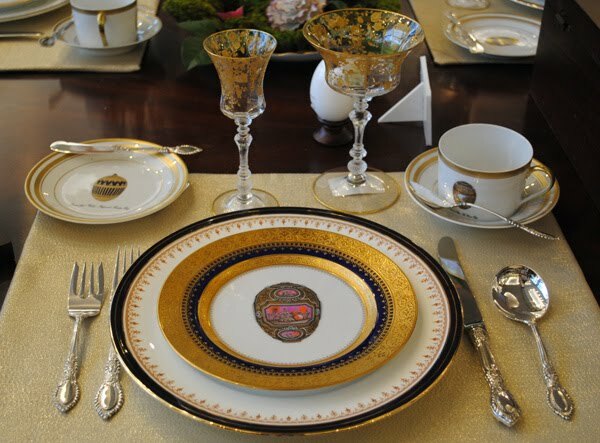 Oh, those are some very beautiful dishes...and tea cups. What a treat that must have been for you to walk through that beautiful store. Once again I loved the visit to replacements. Thanx for sharing and hosting Tea Cup Tuesday. Hi Terri! yay another gorgeous post! I am so in love with that teapot lamp? how fabulous is that for a tea room! beautiful cup..so unique! Thanks for wowing me each week with such beauty and charm...you are the Tea cup Queen Faery!! Have a wonderful day and magical week ahead my friend! Terri, the Lily of the Valley teacup is so pretty! I love Shelley patterns! Another wonderful tour! Thanks for sharing and have a lovely week. could you (if possibel) please delate my No 10 link because I linked it to an old post by accident. I LOVE Lilly of the Valley, I also have wonderful childhood memories of that flower. What a beautiful tea cup! I linked up with you today. Today I have received a note from the post oficce ,Your teapot has arrived and tomorrow I will have it at home! My first daughter's flower is Lily of the Valley. I always take her a posy of them on her birthday. She has loved them since she was a little girl. In Kindergarten she sang the little round that Susan wrote about - White Coral Bells. I so love these tours of Replacements. One day I have to go there in person! Beautiful tea post filled with so many gorgeous things!! I love the tea pot lamp!! 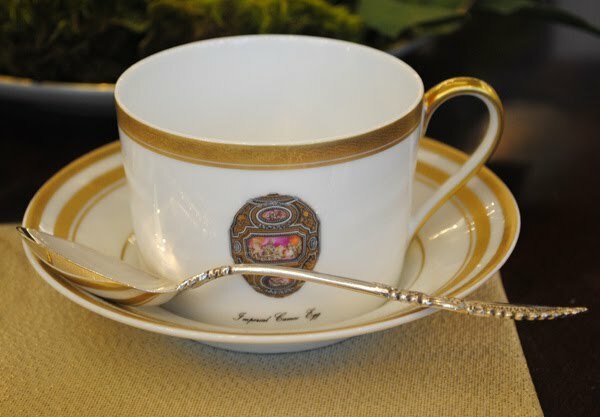 gorgeous tea cup, I am your new follower, great post, off to visit! Your Lily of the Valley tea cup is so lovely, as are all you tea set pieces. I'm in love with the silver tea pot lamp. Its just gorgeous. Thanks for hosting such a fun tea party. Hi! Terri, enjoyed your e-mail. I have a royal winchester lily of the valley tea cup and saucer. And a dear friend gave me the tea pot lamp that is pictured there on your post. It was a gift for caring for her mother for many yrs. It sits on my kitchen couter. The table scape I used for spring was my husbands grandmothers yellow floral platter, I put a pair of rain boots for toddlers from the English rose company, a small gold skelton key and underneath all this I draped a crocheted dolldress that is used as a kitchen decoration( old) to one corner of the platter and arranged everything ontop of it. What a lovely show piece you have! What a fabulous post as usual..,So educational as well as pretty! That lovely and delicate Shelley teacup with the Lily of the Valley motif is indeed exquisite! Thanks for joining Pam and I last week for TTTT and also for Tuesday Tea For Two; sorry it took awhile to get by to visit and also to link up this week. It's been super busy around here! It has been such fun visiting Replacements Ltd. via your blog. That Lily of the Valley teacup is beautiful. The Dainty Tea shape is so pretty. Thanks for the interesting Shelley history. This is an amazing piece of china and such a wonderful story! I love learning these things - so appreciate the day when craftsmen were making such glorious things! Hope you have a great day tomorrow! Oh how I would love to spend some time at Replacements!! 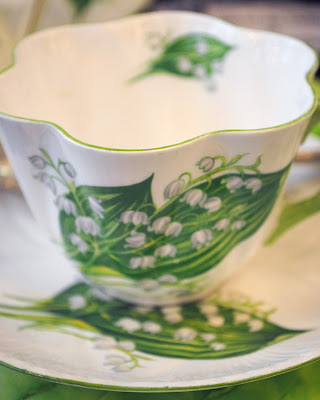 The Lily of the Valley tea cup is so dainty and pretty! I love the flowers..could anything be prettier? Thanks for sharing and your sweet visit!! Hi Terri, I love your gorgeous tea party post. Thanks so much for hosting. I especially adore the fluted edge of your tea cup. I gave my mother one with the same shape for Christmas from a local antique shop. thank you so much for your kind comment. You mentioned the Osage Orange which I had never heard before. So I looked with google and found interesting informations. I learned that the Osage Orange ist just called but not truly a member of the citrus family. They showed also a picture of the very interesting fruit which remind me somehow to Cherimoya fruits. I wonder if the fruit has a special smell like oranges? It is always nice to learn about so complete unknown things. That's what I really apreciate on blogging. Wish you sunshine in your garden. Love the place setting and the tea cups you showed today, oh and the teapot lamp how cute! 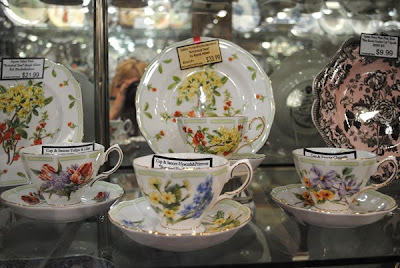 Thank you for always giving the information on the items you spotlight, it helps me to know more about fine china. Love you sis!!! Love your website.Especially the tea cup. Reminds me of my grandmother. Just signed in so I can follow your new projects. Loved this cup. It reminded me of a patch that grew in my Grandma's garden. Happy memories!